Two things you should know about my dad: (1) He believes he was a cowboy in a former life, and (2) he has entirely too much time on his hands. This explains his most recent bizarre behavior. First he places custom fake steer horns over my head. Then we line up 20 feet apart in the backyard. On his signal, I start running, and he chases me. I allow him to catch up with me (otherwise, he’d still be running), he tackles me, takes a small rope and quickly binds three of my legs together. He then triumphantly throws his hands in the air and quickly checks his stopwatch to see if he beat his best time. Then he unties me and I walk out of the ‘arena’, head hung low, acting dejected. Sometimes I lose myself in character and sadly ‘moo’ in defeat. In my tenure at this home I have suffered all manner of humiliation. Typically, it’s embarrassment by association; if you hung with my dad for at least two minutes, you’d understand. But this takes the prize. Sometimes the neighbors watch in amazement, sneaking peeks over the fence so that Dad won’t spot them and recruit them as rodeo clowns. Now, inspired by a circus act he saw recently, he’s considering getting a monkey, outfitting it in fancy western gear, and having it ride me as I race around decorated barrels. Just shoot me. Well, it could be worse. At least he’s not challenging me to a gunfight in the street at high noon, engaging me in a bar fight, or dressing me up as a saloon girl (I’d look hot). There’s so much to be thankful for. And yet, I do worry that his obsession will rub off on me. Luckily, unlike some, I know the line between fantasy and reality…now, if you’ll excuse me, I’ve got to go rustle up some grub. Then I’ll be hankerin’ to ride into town to see who needs killin’. Happy trails, dude. 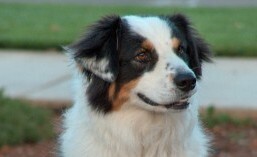 This entry was tagged aussie, australian shepherd, blog, cow, cowboy, dogs, gunfight, humor, rodeo, western gear. Bookmark the permalink.